I have a very friendly and relaxed personality, with the ability to understand the needs of both clients and guests, as well as service providers. Coupled with my meticulous planning I create a happy and smooth running experience for everyone. My 30 years professional experience in the Hospitality & Catering Industry has given me all the skills to oversee any event. Although born in Cheshire, it wasn’t until I moved to Jersey, with my family, that I trained and joined the Guild. 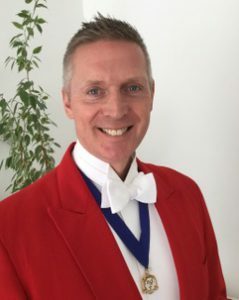 I continue to grow my client base and pride myself in being the first resident toastmaster to be appointed by a Channel Island Hotel. wedding receptions to grand banquets. I remain a dedicated professional at all times whilst ensuring either a formal, informal or an e fficient blend of both.